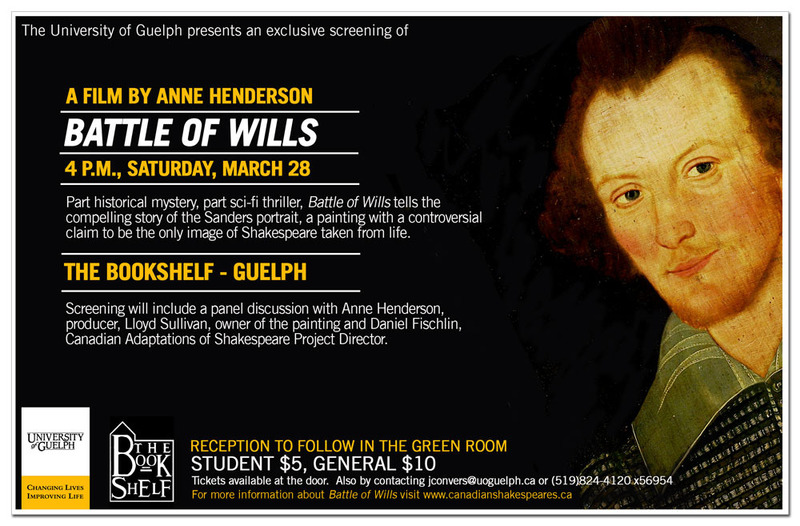 On Saturday March 28, 2009, 4:00 PM, a Guelph premiere screening of director Anne Henderson’s film, Battle of Wills, will occur at the Bookshelf in downtown Guelph. The film documents the amazing story behind the Sanders portrait, the only documented image of Shakespeare produced in his own lifetime. Participants in the film include Joseph Fiennes, star of Shakespeare in Love; Daniel Fischlin, CASP Founder and Director; Angus Neill, British Art Expert (http://www.felder.co.uk/08shakespeareinfo.htm); Lloyd Sullivan, the Canadian owner of the Sanders Portrait; and many others. CASP played a crucial role in introducing Anne Henderson to Lloyd Sullivan and in helping with seed monies that funded the project as well as research associated with the project. The film opened as the first film in the Montreal Film Festival (FIFA) on Thursday March 12, 2009. The screening will be followed by a Q&A with Director Anne Henderson; Lloyd Sullivan; and Daniel Fischlin. Cost: General: $10 / Student: $5. Tickets available through the School of English and Theatre Studies at the University of Guelph. A reception will follow the Q&A. Tags: anne henderson, battle of wills, bookshelf, film, montreal film festival, sander's portrait | Permalink.